Aydon Castle stands on a bluff that drops steeply on three sides to the Cor Burn as it flows south west towards its meeting with the River Tyne. As the crow flies, it is only about a mile and a half north east of Corbridge, but the local topography means that reaching it involves looping around to the east then north, first on the B6321 and then on minor roads that bring you to a car park a couple of hundred yards short of the castle. From the car park, you stroll along a farm track that rapidly opens up to give views of the north west curtain wall of the castle. It is worth bearing in mind that this was pretty much the only view available to any attackers who did not fancy approaching up the very steep sided valley that wraps round most of the rest of the Aydon Castle. On the opposite side of the track is an extensive farmstead, largely built from what appears to be the same stone as the castle itself. The scale of the farmstead leads you to wonder how much of the structure you are visiting has been incorporated into the surrounding buildings. There is actually no cause for concern, as the castle is in a surprisingly complete condition, and this is especially true of the more important parts of it. As you approach, it is worth taking note of the prominent garderobe projecting from the front wall not far from the main gateway. This was built to serve a range of buildings, now gone, on the inside of the wall, but the placement of this outlet so close to the castle gate does suggest a more relaxed approach to bodily functions than perhaps we enjoy today. The main gate is simply that: a gate set into the curtain wall. The approach to it was, arguably, defended by the tower whose remains can still be seen at the northernmost point of the curtain wall, but the absence of elaborate defences or a barbican is one of many indications that Aydon Castle was not really designed as, or built to be, an impregnable fortress. Perhaps it should have been: as a defensive structure, Aydon Castle was a spectacular failure. You get a little more sense of the layout of the castle once you are through the main gate. To your left the outer courtyard continues as far as a building at the far end which is home to the visitor reception and shop, while to your right the front wall carries on round past stone stables that are relatively modern. Directly ahead of you, running along the south side of the structure, is the heart of the castle, another gate within a second defensive wall leading to an inner courtyard, with ranges of buildings beyond. It helps to understand the layout at Aydon Castle if you know how it came to be here in the first place, and how it evolved over time. Aydon first appears in surviving records in 1225. In 1284 the estate here was inherited from his mother by Hugh de Gosbeck, a man whose main property interests lay in Suffolk. In the early 1290s he sold Aydon to another Suffolk landowner, Robert de Raymes, who appears to have taken the decision to relocate his interests and his family to Northumberland. Presumably it was much easier to expand an estate and make your mark in the relative backwaters of the north. And besides, though Aydon lay just some 30 miles from the nearest point on the Scottish border, there had been peace between the two neighbouring nations for generations. When Robert de Raymes arrived at Aydon, he seems to have found a wooden hall used as an occasional residence by the de Gosbecks, located on what amounted to a bluff above the valley of the Cor Burn. In about 1295 de Raymes started work on a stone residential range, now known as the solar block, at the east end of the wooden hall, and a garderobe block at the corner of the solar closest to the drop into the valley below. 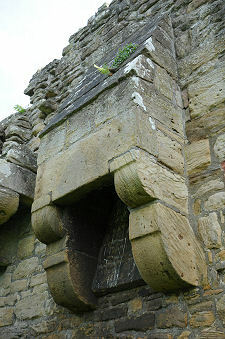 Projecting stones on the east face of the solar block suggest that it was Robert's intention to expand further in this direction, but in 1296 war broke out between Scotland and England. This must have caused Robert de Raymes to question his decision to move north only a few years earlier, and at a more practical level it caused him to focus his efforts on turning what was intended to be a fine, largely undefended, mansion, into something more resembling a castle. The first stage of this was to make the improvements needed to support a large defensive garrison. This involved building a stone hall block to replace the original wooden hall. Evidence in the form of poor stonework and construction where the new hall meets the original solar suggests that building was done in a hurry, and possibly without access to the skilled masons needed to maintain the quality of the workmanship of the solar block. The hall block included provision of a kitchen at its west end, but this was made redundant when another major expansion of the accommodation followed soon afterwards, this time by adding a large purpose built kitchen block extending north from the west end of the hall. Defensive walls were added to create the inner courtyard, and more ranges of buildings were constructed along the inside of a new, outer, curtain wall, which created the outer courtyard. All this work appears to have been completed by 1315, when Robert de Raymes wrote about Aydon being "lately battlemented with a wall of stone and lime". In the event, none of this did any good at all. Aydon lies close to the route of Dere Street, since Roman times one of the main routes into (or from) Scotland, and this made it an obvious target for Scottish raiders. Robert de Raymes was away when the Scots turned up in force at the gates of Aydon Castle in 1315. He had left his newly fortified castle fully garrisoned by men armed with crossbows, stocked with £300 worth of food, and under the command of a Hugh de Gales. De Raymes was far from impressed when the garrison simply surrendered after the Scots arrived, allowing them to pillage the supplies and set fire to the buildings. But you don't really have to look any further than the absence of serious defences for the main gates to realise that if the garrison had tried to hold out, they would merely have been delaying the inevitable, probably at the cost of their own lives. 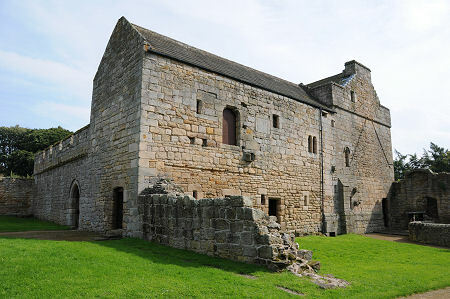 Northumberland fell into a state of civil disorder in 1317, and on 5 December of that year Aydon Castle was again captured, this time by English rebels led by the same Hugh de Gales who had failed to defend it against the Scots two years earlier. Whatever had been rebuilt since the visitation by the Scots was again burned, and everything portable, from gold ornaments to structural woodwork, was carried away. Robert de Raymes had died and been succeeded by his son, also called Robert, by the times the Scots, this time under David II, attacked Aydon Castle in 1346. The castle was again easily captured and badly damaged. 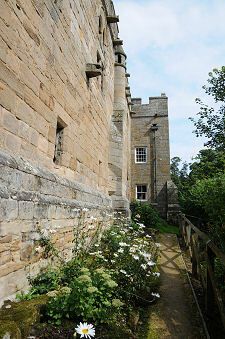 By the end of the 1300s, the de Raymes family had moved to a more easily defended home elsewhere in Northumberland, and Aydon Castle was occupied by tenants. It was yet again attacked and damaged by Scots in 1448, and later sold to the Carnaby family. They did much to restore and redevelop the castle, but by the early 1600s it was once more let out to tenants. The estate was sold to the Collinson family for £653 in 1654, and again, this time for £2,350, to John Douglas in 1702. In 1751 it passed by marriage to the Blackett family, who have owned the estate since then. Aydon was refurbished and restored in the 1830s by Sir Edward Blackett, and at the same time the interiors were adapted to better serve their use as farm buildings. Aydon continued in use as a highly unusual farmstead until the 1960s. Over the previous three decades a series of tragedies involving tenants of the castle had given it a reputation as an unlucky place to live, which made it increasingly hard to let, and in 1966 Sir Charles Blackett placed Aydon Castle in the care of the Ministry of Works. They restored the structure of the castle, and removed most of the fixtures and fitting added from the 1800s onwards. Today it is in the care of English Heritage. From a visitor's point of view, the result of this story is the survival of a considerable part of a highly unusual mansion house/castle largely dating back to the 1300s. 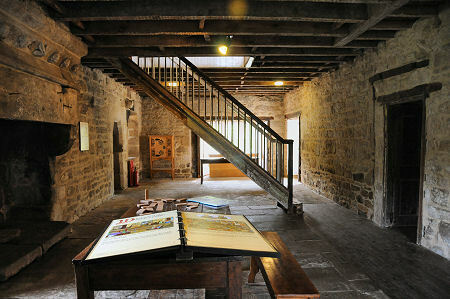 There are oddities, such as the iron staircase inserted into the centre of the solar block and the configuring of the ground floor of the kitchen block to house livestock, which show that Aydon Castle has had a life since then, but these simply add to the remarkable character of the place.